4health promises great nutrition at a low price, but is it really better than the average economy brand? Find out in our unbiased 4health cat food review. We’ve analyzed 4health and graded it according to the We’re All About Cats standard, evaluating the brand on species-appropriateness, ingredient quality, product variety, price, customer experience, and recall history. Here’s how it rates in each of these six key areas. We give 4health cat food a 34 out of 60 rating or a C grade. This brand is owned by Tractor Supply Co., an American home and ranch chain based in Tennessee. Tractor Supply began in 1938 as a mail order tractor part supply company. By 2004, the company was listed as one of Fortune magazine’s 100 fastest growing businesses. Pet food and supplies are a major part of Tractor Supply’s business. As of the company’s 2017 report, livestock and pet products accounted for 47% of the chain’s total sales. 4health is marketed as a better kind of store brand—one that offers “Premium Ingredients at a Great Value”. 4health is made by Diamond Pet Food, a US-based pet food manufacturer that also makes food for Taste of the Wild, Canidae, and other brands. Diamond owns five manufacturing facilities scattered across the United States. 4health’s ingredients are sourced primarily from the United States, though Diamond obtains a few ingredients from other countries including France, Belgium, and New Zealand. Folic acid, taurine, and potentially some other ingredients are sourced from China. Has 4health cat food been recalled? 4health food has been recalled twice and other Diamond-produced brands have been recalled multiple times over the years. We won’t get into all the Diamond brand recalls now, but here are more details on 4health’s recall history. In 2013, Diamond recalled several cat food brands, including 4health, due to potentially insufficient thiamine levels. Diamond recalled all 4health food manufactured in Gaston, South Carolina due to potential salmonella contamination. What kinds of cat food does 4health offer? 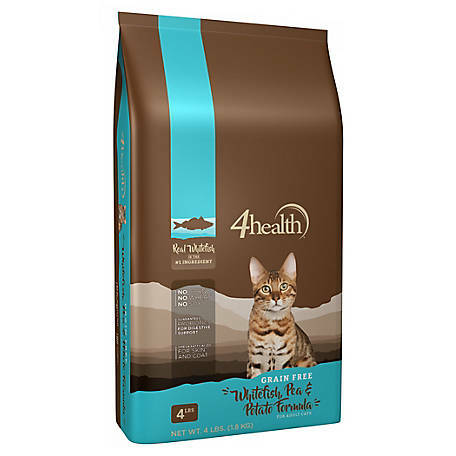 4health’s cat food lineup includes both wet and dry recipes. Whether wet or dry, 4health recipes feature meat as the first ingredient, complemented by a variety of fruits and vegetables. None of their formulas contain corn, soy, or wheat. In addition to the standard vitamins, minerals, and amino acids that make each recipe nutritionally complete, 4health foods are enhanced with species-specific probiotics, omega fatty acids, and antioxidants. The Original line includes one dry cat food recipe for all life stages. 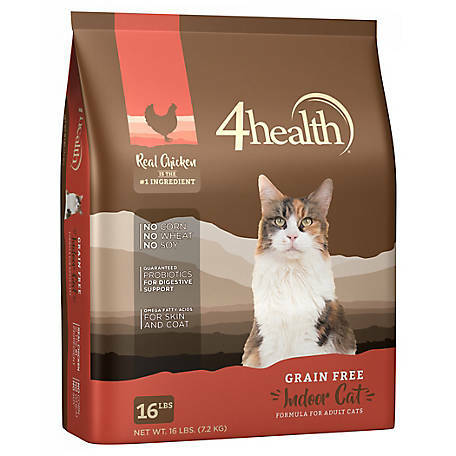 4health’s Grain-Free line includes 13 products—four dry cat foods and nine canned recipes. Untamed™ is a grain-free line that includes two dry recipes for cats. The Special Care line addresses health conditions, including weight management, sensitive skin, and sensitive stomachs. It includes six recipes. Two are dry and four are canned foods. 4health says this chicken-based dry food was developed to meet the nutritional needs of indoor cats. Like most indoor cat food, it’s relatively low in calories to help less-active indoor cats maintain a healthy weight. It also includes antioxidants and omega fatty acids for superior skin and coat health. But, really, what’s this food made of? Let’s take a closer look. The ingredient list starts with chicken, a species-appropriate ingredient loaded with protein and other nutrients. The second ingredient is chicken meal. This dehydrated form of chicken has water and fat removed and is a concentrated source of protein. While some suggest that rendering reduces digestibility, experiments show that chicken meal is just as digestible as fresh chicken—if not more. Turkey meal and a small amount of ocean fish meal are included later on the ingredient list as additional sources of animal protein. A series of legumes increase the food’s protein, fiber, and carbohydrate content. The food contains garbanzo beans, peas, and lentils. Like other foods made for indoor cats, the food contains powdered cellulose—wood pulp—as a source of fiber. It’s thought that fiber may help to reduce hairballs and some believe it could increase satiety. Chicken fat is the food’s primary fat source, providing a variety of bioavailable fatty acids. The food is supplemented with a variety of probiotics along with dried chicory root as a source of prebiotic fiber. The food contains traces of tomatoes, blueberries, and cranberries as sources of antioxidants. It’s fortified with vitamins, minerals, and amino acids to make each meal nutritionally complete for adult cats. Overall, this is a plant-rich food that’s low in protein with low fat and high carbohydrate content. Each cup of the food has 313 calories. Chicken, Chicken Meal, Garbanzo Beans, Peas, Turkey Meal, Powdered Cellulose, Lentils, Chicken Fat (Preserved With Mixed Tocopherols), Natural Flavor, Ocean Fish Meal, Flaxseed, Sodium Bisulfate, Dl-methionine, Potassium Chloride, Choline Chloride, Taurine, Dried Chicory Root, L-carnitine, Tomatoes, Blueberries, Cranberries, Dried Lactobacillus Plantarum Fermentation Product, Dried Bacillus Subtilis Fermentation Product, Dried Lactobacillus Acidophilus Fermentation Product, Dried Enterococcus Faecium Fermentation Product, Dried Bifidobacterium Animalis Fermentation Product, Zinc Proteinate, Vitamin E Supplement, Niacin, Manganese Proteinate, Copper Proteinate, Zinc Sulfate, Manganese Sulfate, Copper Sulfate, Thiamine Mononitrate (Vitamin B1), Vitamin A Supplement, Biotin, Potassium Iodide, Calcium Pantothenate, Riboflavin (Vitamin B2), Pyridoxine Hydrochloride (Vitamin B6), Vitamin B12 Supplement, Manganous Oxide, Sodium Selenite, Vitamin D Supplement, Folic Acid. Whitefish and fish meal appear to be the primary protein sources in this dry cat food. This kibble is a grain-free product featuring a combination of fish, fish meal, and a variety of plant ingredients. The food’s first ingredient is “whitefish”. The name doesn’t refer to any single fish species. Instead, it’s a fisheries term used to refer to various species of white-fleshed fish living in both fresh and saltwater environments. It’s unclear which type—or types—of whitefish is present in this 4health food, but it’s likely some combination of haddock, whiting, or cod. The second ingredient is even more vaguely-named. It’s fish meal. This ingredient is typically salvaged from the ocean catch that isn’t usable for human consumption—also known as trash fish. These fish may be perfectly edible and safe, but they aren’t popular or marketable for people and are sent off to be dried and pulverized for use in animal feed. Fish meal may be partially composed of the by-products of fish processing, including offal and bones. Turkey meal is added as a third source of animal protein. Later on the ingredient list, the food contains a small amount of fresh turkey. Dried ground peas round out the food in several ways. They add to the food’s carbohydrate content, contribute fiber, and help to give the kibble shape and structure. The food contains tapioca as a secondary binding ingredient. It’s a high-starch ingredient that adds significantly to its carbohydrate content. Egg product is the next ingredient. It’s unclear if this ingredient is made from human-quality eggs or if it’s a waste product utilized from human food processing. We don’t know how digestible it is. Chicken fat is added as the food’s primary fat source. Nearing the end of the ingredient list is whole dried potato, a minimally nutritious ingredient that’s rich in carbohydrates. There’s also natural flavor, an additive usually made from hydrolyzed animal tissue. The food contains pea protein, a concentrated source of plant protein sometimes used as an economical alternative to animal-sourced protein. Dried plain beet pulp is added as a source of fiber. The food is supplemented with trace amounts of dried carrots, whole flaxseed, and dried cranberry. It contains a variety of probiotic bacteria and dried chicory root as a source of prebiotic fiber. Finally, the recipe is fortified with vitamins, minerals, and amino acids to make it nutritionally complete and balanced for adult cats. Overall, the food has moderate protein content, moderate fat, and high carbohydrate content. The food has 359 calories per cup. The first canned food on the list is made with loads of fresh chicken, including muscle meat and chicken liver, a species-appropriate source of nutrients and protein. Along with chicken, the food features dried egg product as a source of animal protein. This ingredient could be made from human-quality eggs or consist of dehydrated waste from egg processing. Potato starch is added to thicken the gravy. This canned food has a touch of “natural flavor”, an additive typically made from hydrolyzed animal tissue. The food is stabilized with guar gum, a natural thickening agent derived from guar beans. It’s not a species-appropriate ingredient, but in the small quantities found in cat food, it shouldn’t cause health problems. The food is supplemented with cranberries and ground flaxseed. Menhaden fish oil is added as a source of omega-3 fatty acids, but it’s not the only source of fat in the food. It also contains sunflower oil, a plant-sourced fat. The food is fortified with vitamins, minerals, and amino acids that make it nutritionally complete and balanced for adult cats. Overall, this food is high in animal protein with moderate fat and low carbohydrate content. The food has 78 calories in each 3-ounce can or 26 calories per ounce. Chicken, Chicken Broth, Water Sufficient For Processing, Chicken Liver, Dried Egg Product, Potato Starch, Natural Flavor, Guar Gum, Cranberries, Ground Flaxseed, Salt, Sodium Phosphate, Menhaden Fish Oil (Preserved With Mixed Tocopherols), Potassium Chloride, Sunflower Oil, Vitamins (Vitamin E Supplement, Thiamine Mononitrate, Niacin Supplement, D-Calcium Pantothenate, Pyridoxine Hydrochloride, Riboflavin Supplement, Vitamin A Supplement, Biotin, Vitamin D3 Supplement, Vitamin B12 Supplement, Folic Acid), Calcium Carbonate, Taurine, Minerals (Ferrous Sulfate, Zinc Oxide, Copper Proteinate, Potassium Iodide, Manganese Sulfate, Sodium Selenite), Inulin, Choline Chloride, Dl-Methionine, Magnesium Sulfate, Rosemary Extract. 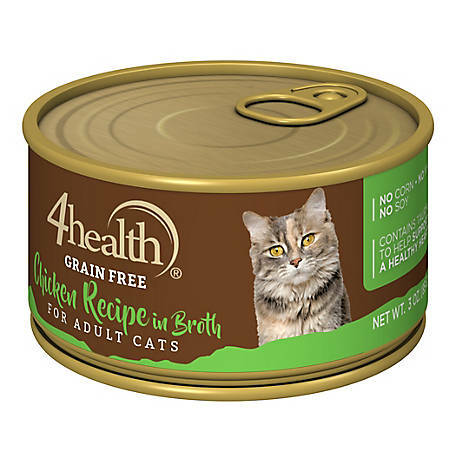 What do customers think of 4health cat food? 4health gets almost exclusively positive reviews. Happy customers like that the brand meets both their nutritional standards and their price needs. Most negative reviewers say their cat didn’t like the food or experienced GI problems after switching to it. How much does 4health cat food cost? If you’re feeding the average 10-lb cat, 4health’s dry recipes will cost from $0.16 to $0.24 per day—just a few cents more expensive than budget brands like 9Lives and Friskies. 4health’s canned food is more expensive than its kibble. 4health wet cat food costs about $1.62 per day. Unlike the average economy brand, most 4health recipes are made without animal by-products, artificial colors, and potentially harmful preservatives. Its recipes are similar to those offered by brands like Merrick—at a third of the price. Overall, is 4health a good choice? 4health is a good choice if you’re looking for an affordable alternative to grain-free natural foods. Their foods aren’t flawless, but they dodge some of the most common pitfalls of other economy brands. Their wet foods are relatively low in carbohydrates and combine muscle meat and organs without bowing to the use of animal by-products, and they’re free of carrageenan. 4health dry foods are less impressive, but they, too, have some good qualities. Unlike similarly-priced kibble, most 4health dry foods contain named meats and don’t rely heavily on plant and meat by-products. 4health products, especially their wet foods, are worth trying out if you’re looking for an economical, meat-based food. Where is 4health cat food sold? It’s a Tractor Supply exclusive brand. You can buy it at your local Tractor Supply store or online on Tractor Supply’s website. It’s also sold on Amazon, but with a limited product selection. 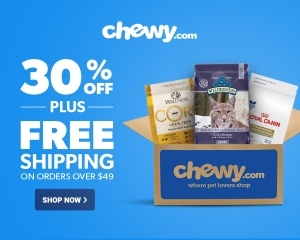 Click here to shop for 4health cat food on Amazon.